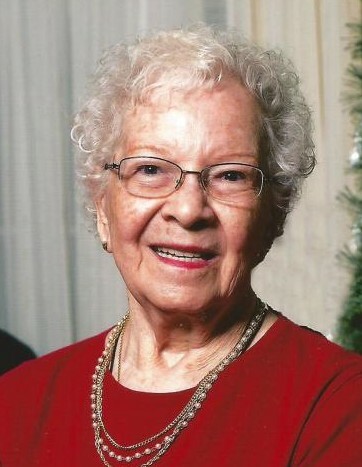 Methella M. “Billie” Raley Kramer, originally from Tell City, Indiana, passed away peacefully Friday, March 15, 2019 at the age of 94. Billie was preceded in death by her beloved husband of 70 years, Clarence McNeil “Mac” Kramer; daughter, Elizabeth Ann Kramer Freeman; son-in-law, Augustus “Mac” Freeman; sisters, Janet Taylor and Kathy Kellams; brothers, William D. Raley and George Raley; and parents, William F. and Muriel Gaynor Raley. Surviving is son, Paul M. (Carolyn) Kramer; grandchildren, Kristi (Michael) Christman, Les (Michelle) Freeman, Scott Freeman, Ed (Suzanne) Freeman, Kelly (MacKenzie) Horner, and Douglas Kramer; great grandchildren, Morgan, Brian, Ryan, Bradley, Logan, Spencer, Anna, Penelope and Oliver; and brother, Raymond Raley. Billie loved the Lord like she loved her family, with her whole heart. She believed that it is our purpose to pass God’s deep love for us on to others. Visitation is Monday, March 25, 2019 from 11:00 a.m. to 1:00 p.m. at Kento-Boo Baptist Church, 7037 Curtis Avenue, Florence, Kentucky with the funeral service to follow at 1:00 p.m. Entombment at Forest Lawn Memorial Park, Erlanger, Kentucky. Middendorf-Bullock Funeral Home, Erlanger, is serving the family. Memorials are suggested to Kento-Boo Baptist Church, Hope Lodge of Central PA, 125 Lucy Avenue, Hummelstown PA 17036, or the American Cancer Society, 297 Buttermilk Pike, Fort Mitchell, KY 41017.